The breath… be it known for its destined intention… to nourish, energize, restore, renew, the life force that sustains BEING. When revered, when we become one with its intention, we become a sustainer of energy, wellbeing and life itself. In my studies and practices at the Himalayan Institute of Yoga Science, I came to marvel at our ability to direct our breath with mindful intention. YES, we can be one with the intent of the breath, and bring sustaining power to every cell, every organ, every system. One of the offerings of APOGEE Acu-Tone™is the practice of the Acu-Tone™ Governing Vessel Breath. The centering strength it brings forth is ever delightfully welcomed by all who experience its profound effect. The breath travels, with focused intention, through each point of the Governing Vessel Meridian, starting two inches below the navel, through to the base of the spine, up the spine, to the mid point of the crown on inhalation, and from the crown to the space below the nostrils on exhalation. Points as indicated on the illustration. It has been found that a particular ‘count’ to the focus and positioning of the breath through the pathway of the Governing Vessel Meridian, is itself a meditation, bringing deep relaxation, and a calm, experienced as an overall and peaceful feeling of well being. 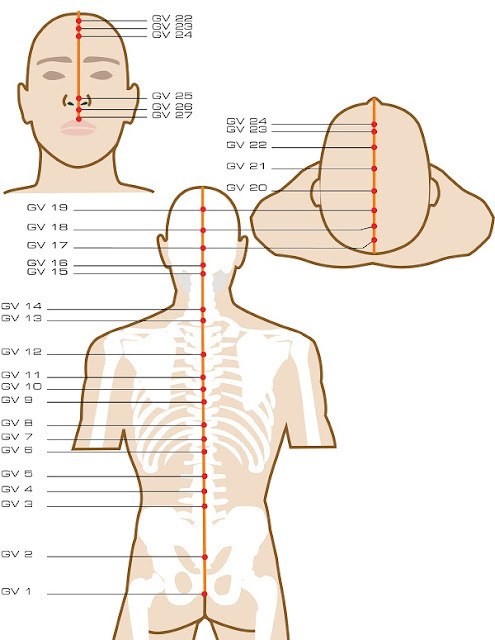 To the count of 1, begins the focus on the point two inches below the naval, to the count of 2, to the mid area between the naval point and the base of the spine, to the count of 3, going to the base of the spine, this being GV 1. to the count of 21 to GV 21, this the mid point of the crown of the head, this the count, and pathway on inhalation. At GV 21, center of the crown, one begins the count of exhalation through GV 22 to GV 27. Each count follows the GV Meridian pathway. The sequence is then repeated with focus again initiated at the point 2 inches below the naval. YES, a 1, 2, 3, then go the GV pathway from GV 1 to GV 27. Repeat 10 to 30 times for a most self-possesing, and blissful liberating meditative experience. The GV Acu-Tone™ breath can bring renewal throughout the course of the day, simply by 3 repetitions, prior, during or post any encounter, activity, interchange, or event, offering a dynamic breath pause, renewed focus, and a revitalized sense of calm and power. Specific sequences of the Governing Vessel Acu-Tone™breath, along with visualizations, are offered for particular stress situations, allowing one to maintain composure and mindfulness. For all who visit and read the post, I welcome your question, and would be open to guiding you though the process via a conference call.